Our selection of outdoor stair lifts feature durable aluminum track, seat widths in excess of 20 inches, and advanced protective coverings to keep moisture and exposure from damaging your lift. A ground fault interrupter (GFI) circuit outlet is required for operation, and these stairlift models are not available as battery-operated units. We recommend these rugged stair lifts for customers who need a lift to provide access to exterior entrances of homes and businesses. Questions? 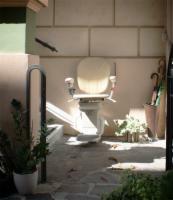 Call the stair lift experts at 1-888-301-2610.